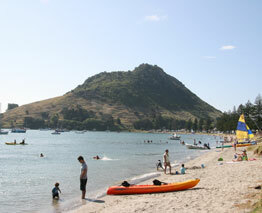 Mount Maunganui, (Mauao) is a dormant volcanic cone resting at the end of the town’s peninsula bearing its name. The mountain holds great cultural significance to local Maori and has been known for more than 600 years, as a place of occupation, defence and refuge. Central to much of the beach side visitor activity and surf lifesaving competition action over the summer months, the mountain also boasts one of the most popular walkways in the Tauranga region. Mauao provides a safe circular 45 minute track for keen runners and walkers or those taking in the fantastic scenery. There are many restful seating areas to watch ships and boats cruise by. For the more adventurous and physically fit, Mauao offers a walking track up to the summit of the Mount. After a good, strong uphill walk through native bush, the stunning views over the coast and city are your reward. 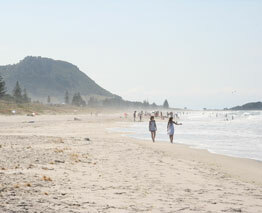 On a calm day, spot paragliders swooping down the south-western side of Mount Maunganui. The continually rising thermals give excellent opportunities for the sport. Please note: Tauranga District Council asks visitors not to smoke cigarettes or light any fires on the mountain, as this is a fire danger to vulnerable flora and fauna.